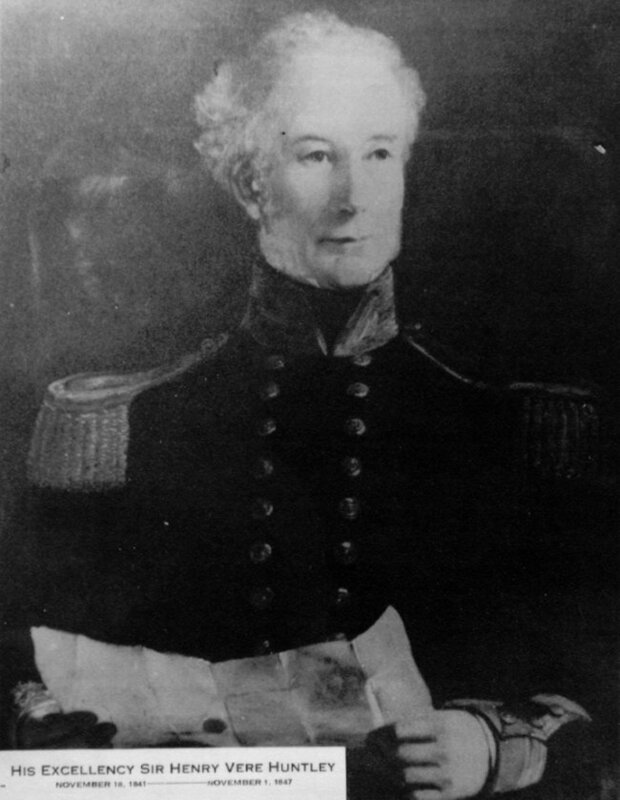 HUNTLEY, Sir HENRY VERE (baptized Henry Veel), naval officer and colonial administrator; b. 1795 and baptized 29 Nov. 1796, third son of the Reverend Richard Huntley and Ann Webster of Boxwell Court, Gloucestershire, England; d. 7 May 1864 in Santos, Brazil. Little is known of Henry Vere Huntley’s early life except that he entered the British navy at age 14. His formal education was probably limited, although in later years he did indulge a literary bent. Following the Napoleonic wars he remained in the navy and served in many exotic parts of the world, rising to the rank of commander in 1838. 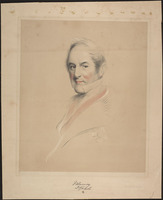 After 30 years of distinguished naval experience he became lieutenant governor of the British settlements on the River Gambia in western Africa in 1839. 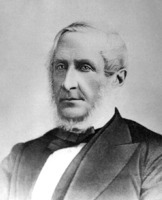 Huntley’s health appears to have suffered from the African climate, and in 1841 he returned to England to accept the lieutenant governorship of Newfoundland. However, the Colonial Office withdrew the offer in favour of Sir John Harvey*, and sent Huntley to Prince Edward Island instead. On 9 October, prior to his departure from England, he was knighted. Five weeks later he arrived in the island colony, which was then absorbed in struggle over the land question. Huntley was sympathetic to the rights of property, and was pleased by the electoral defeat in mid 1842 of the radical Escheators led by William Cooper, who had controlled the assembly for four years. In early 1843 a public meeting at New London declared the government to be conducted “for the benefit of a couple of dozen of land Speculators, their connexions, dependents, and parasites,” and gave the resolution to their assemblyman, Duncan MacLean, for publication. Huntley directed that MacLean, whom he had privately described as “most violently revolutionary,” be prosecuted for libel against the government. The prosecution was successful, but at Huntley’s request sentence was not passed; the case was simply to serve as a warning. However, the Escheators, blocked by the parliamentary process, concentrated their efforts, with some success, on direct action in the countryside, such as preventing evictions and resisting collection of rents. The burning of the home of a Cunard agent in March 1843 caused Huntley to send soldiers to eastern Kings County. These actions, and his friendship with such unpopular landlords and agents as Father John McDonald* and James Horsfield Peters*, firmly identified the governor in the popular mind as a servant of the local Family Compact. Yet the alliance between Huntley and the Charlottetown oligarchy did not endure. His official correspondence first betrayed reluctant disillusion because of the failure of the Tory-dominated assembly to make adequate provision for the repair of his official residence or to augment his salary. His annual allowance of £1,000 met only about two-thirds of his expenses, and by early 1844 he apparently found it necessary to withdraw his patronage from several, though not all, public organizations. But there was another, larger point of difference, one in which Huntley had the full backing of the Colonial Office: under the leadership of the speaker, Joseph Pope*, the assembly consistently overspent its revenues. Huntley believed this fiscal unorthodoxy to be a demagogic device to cultivate the approval of rural Islanders, whom he considered incapable of appreciating more enlightened policies. On both issues, the maintenance of official dignity and the state of the treasury, the governor believed Pope’s majority to be lacking the moral courage to do more than reflect rural prejudices. An impetuous man, prone to direct and dramatic actions, Huntley decided to make public his views on the necessity of balancing revenues and expenditures. Against Pope’s wishes, he included pointed observations on the public debt in his addresses to the assembly in 1845 and 1846 (unaccountably, historians W. Ross Livingston, W. S. MacNutt*, and Wayne E. MacKinnon have interpreted these remarks as references to supposed private debts of Pope). Tension continued to increase over financial questions, and in March 1846 Pope charged in the assembly that Huntley’s “underhanded proceedings” were a “degradation” of him as an executive councillor and legislator. Huntley then suspended Pope from the Executive Council for these and related remarks. Pope, with the support of an aroused assembly, appealed to the Colonial Office for reinstatement. Lord Grey, the British Colonial secretary, sustained the appeal and directed that any further proceedings be dropped, not least because they had arisen from words uttered in the assembly. Vindicated, Pope then resigned from the council. The controversy with the speaker, which generated a staggering volume of correspondence between Charlottetown and London, had also made unbridgeable the gulf between Huntley and the local élite, which supported Pope. The governor sought a new alliance and in April 1847 appointed a leading Reform assemblyman, George Coles*, to Pope’s seat on the council. Accepting constitutionally erroneous advice from the majority in the assembly, Huntley required Coles to submit to the unusual procedure of a new election, which he won. But the divisive nature of the appointment was revealed when an influential executive councillor, Colonial Secretary Thomas Heath Haviland, publicly voted against Coles. Pleased to have the new, if limited, leverage of a seat on the council, the Reformers raised petitions for the continuance of Huntley’s term beyond six years. Alarmed, the Tories circulated a contrary petition and sent it to London with a three-man delegation, which included Pope and Edward Palmer*, an executive councillor who had resigned explicitly for the purpose. The opposing petitions simply reinforced Grey’s conviction that Huntley should be relieved at once. He left for England on 30 Nov. 1847, much to the chagrin of the Reformers. Huntley appears to have led a rather chequered existence after his departure from the Island. Less than a year later, after being held briefly in jail, he declared insolvency in England. Although he seems to have been in debt prior to his arrival on P.E.I., in court he attributed his financial plight to the insufficiency of his salary as governor. By 1850 he had led a company of miners to California. In the late 1840s and the 1850s he published several pedestrian books on a variety of subjects, including a description of California. At the time of his death in 1864 in Santos, Brazil, he was back in the British overseas service as a consul. He had been married twice: first, on 20 Sept. 1832 to Anne Skinner (d. 1855) and then in 1859 to Miss Drury of Harrow, Middlesex, England. He was survived by at least two sons and a daughter. Sir Henry Vere Huntley had gone to Prince Edward Island as a career naval officer with nothing in his background to suggest liberal propensities. His early dispatches reveal him as entirely disposed to adopt the views of the local élite. Yet by the conclusion of his tenure he was allied with one of the most militant and progressive reform movements in British North America. He was even advocating what he called responsible government, although his understanding of it seems to have centred on the responsibility of executive councillors to resign when not in harmony with the governor. His conversion to the cause of reform does not appear to have been the product of a slow maturation of convictions. It owed more to his wilful personality, which together with a rigid sense of duty had led to his estrangement from the Island’s Family Compact. Once the disaffection became complete, the oligarchy with great vindictiveness waged, in Edward Whelan’s words, “an exterminating war.” The strategy of Huntley’s new defenders, such as Whelan (who had once called him “the Gambian Crocodile” because of his desire for an increase in salary), was to exploit the split to their own advantage. Huntley had been placed in an almost impossible position: between a truculent popular movement and a deeply entrenched oligarchy possessing a greater sense of permanence than any governor. It is difficult to imagine what he could have done to lessen the social tensions which, combined with quarrelsome personalities, made Island politics notoriously bitter and turbulent. Yet, faced with this situation, Huntley did not display remarkable talent or diplomacy. Indeed, because of his excessive sensitivity to slight, his impulsiveness, and, to a considerable extent, his blunders, he became one of the most beleaguered men to occupy government house in Prince Edward Island. H. V. Huntley’s publications include: California: its gold and its inhabitants (2v. in 1, London, 1856), also published as Adventures in California (London, n.d.); Observations upon the free trade policy of England, in connexion with the Sugar Act of 1846 . . . (London, 1849); Peregrine Scramble; or, thirty years’ adventures of a blue jacket (2v., London, 1849); Seven years’ service on the slave coast of western Africa (2v., London, 1850). PAPEI, Central Academy, Minute book, 83–84, 93, 95, 104; H. V. Huntley to Webster Huntley, 10 May 1842 (copy). PRO, CO 226/62–65, 226/67–72, 226/76, especially 226/62, 113–16, 184; 226/63, 337; 226/64, 3–15, 30–31; 226/65, 86–93, 131–36, 139–50, 155, 190–235, 250–56, 260–61; 226/67, 3613, 192–207, 273–75, 298–305; 226/68, 25–29, 140–47, 161–62, 296, 496–98; 226/69, 90, 100–2, 129–33, 152–94, 287–90, 317–35, 453–54, 479–89, 501–5; 226/70, 104–313; 226/71, 44–45, 61–64, 67–73, 105–6, 148–59, 246–67, 287–376, 420–31, 472–93; 226/72, 56–59, 111–48; 226/76, 234–36. Elgin-Grey papers (Doughty), I, 68–69, 72–73; IV, 1375–78. P.E.I., House of Assembly, Journal, 1845, 6, 95; 1846, 6, 96–99, 114–17, 123; 1847, 7–8, 145. Colonial Herald (Charlottetown), 4 Sept., 13 Nov. 1841. Constitutionalist (Charlottetown), 2, 9, 16 May 1846. Examiner (Charlottetown), 7, 14, 21 Aug., 2, 16 Oct., 27 Nov., 4, 11 Dec. 1847; 11 Sept. 1848; 12 Feb. 1850; 4 July 1864. Islander, 30 June, 7 July 1843; 12 Jan., 29 March, 5 April 1844; 8 Sept. 1848; 1 July 1864. Palladium (Charlottetown), 7, 11 Sept., 16 Nov., 14, 28 Dec. 1843; 4, 18 Jan., 7 March, 11, 18 April, 9 May, 28 Dec. 1844. Ross’s Weekly (Charlottetown), 14 July 1864. Royal Gazette (Charlottetown), 16 Nov., 7 Dec. 1841; 14, 28 March 1843; 19 March 1844; 23, 30 Nov., 14 Dec. 1847; 8 Oct. 1850. DNB. W. R. Livingston, Responsible government in Prince Edward Island: a triumph of self-government under the crown (University of Iowa studies in the social sciences, IX, no. 4, Iowa City, 1931), 20–36. 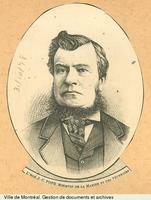 Peter McCourt, Biographical sketch of the Honorable Edward Whelan, together with a compilation of his principal speeches; also interesting and instructive addresses to the electors of the second district of King’s County, and a brilliant lecture entitled “Eloquence as an art” (Charlottetown, 1888), 5–8. MacKinnon, Government of P.E.I., 30–31, 40, 49, 73, 78–81, 170. W. E. MacKinnon, The life of the party: a history of the Liberal party in Prince Edward Island (Summerside, P.E.I., 1973), 14, 19. J. C. MacMillan, The history of the Catholic Church in Prince Edward Island from 1835 till 1891 (Quebec, 1913), 45–46. MacNutt, Atlantic provinces, 231–34. Robertson, “Religion, politics, and education in P.E.I.,” 33–37. W. S. MacNutt, “Political advance and social reform, 1842–1861,” Canada’s smallest province (Bolger), 114–21. Ian Ross Robertson, “HUNTLEY, Sir HENRY VERE,” in Dictionary of Canadian Biography, vol. 9, University of Toronto/Université Laval, 2003–, accessed April 26, 2019, http://www.biographi.ca/en/bio/huntley_henry_vere_9E.html.